Shipping Dimensions: 15" x 11.5" x 0.2"
Ravensburger has been making toys for the hand, head, and heart for over 130 years. Our jigsaw puzzles for kids will bowl you over with premium quality, in terms of both content and material. Ravensburger's puzzles are made to fit precisely - no matter how large or small the puzzle, each is precision made so that every piece fits perfectly, without frustration. Best of all, every single piece in this puzzle is unique - no duplicates! Jigsaw puzzles help support a child's development as they play, building skills such as concentration and creativity, and are great fun for adults, providing a great experience whether you're puzzling by yourself or with a group. 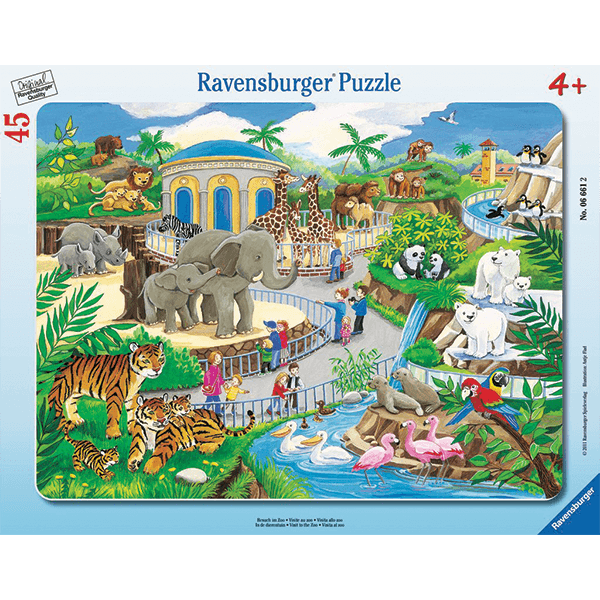 If You Liked Ravensburger Visit the Zoo 45 Piece Puzzle, See More Related Products Below!